As its name suggests, Crater Lake is a large crater lake formed over 7,000 years ago due to the collapse of nearby volcano Mount Mazama. Crater Lake is located in the south-central section of Oregon and is part of Crater Lake National Park. The lake has a maximum length of 6 miles (9.7 km) and width of 5 miles (8 km), it has a surface area of 20.6 square miles and an average depth of 1,148 feet (350 m). Crater Lake's maximum depth is 1,949 feet (594 m) and it has approximately 21.8 miles (35.1 km) of shoreline. Crater Lake is the deepest lake in the entire United States and has the ninth deepest maximum depth of any lake in the world. No waterways flow in or out of the lake, but any water that evaporates is simply replaced by rain and snow. No fish naturally live in the lake but it was stocked up in the late 19th and early 20th centuries, with several species managing to form their own populations. The lake has particular importance to the Klamath tribe of Native Americans; various stories and legends are associated with Crater Lake and it was also a location for vision quests for the Klamath people in the past. It's also an important symbol for Oregon residents and can often be seen on state license plates, as well as appearing on the commemorative Oregon State Quarter created back in 2005. Crater Lake is known for its deep blue color and also features two islands, Phantom Ship and Wizard Island. The lake is also famous for its 'Old Man of the Lake' feature, which is a 30 feet (9 m) tree stump that has been bobbing vertically in the lake for over a century. Activities that can be enjoyed at Crater Lake include scenic drives, hiking trails, and boat tours. The elevation of a location tells us how high or low it is in relation to the mean sea level of Earth. Elevation is an important geographical term that can have a variety of uses, and the elevation of an area can influence its climate too, with higher elevations resulting in lower average temperatures. The surface elevation of Crater Lake is 6,178 feet (1,883 m). The elevation of Crater Lake's caldera rim varies from as low as 7,000 feet (2,100 m) up to as high as 8,000 feet (2,400 m). Wizard Island is one of the key locations on Crater Lake. This is a volcanic cinder cone and is located in the western part of the lake. The elevation at the highest point on Wizard Island is 6,933 feet (2,113 m). Wizard Island has a prominence of just 755 feet (230 m) and can be accessed during the summer by boat. The second island on Crater Lake is the very small Phantom Ship, so called due to the fact that it looks like a ghost ship, especially in dark or low-visibility conditions. Phantom Ship has a top elevation of 170 feet (51.8 m). The elevation of Crater Lake has a strong influence on its climate. Crater Lake is very high up, resulting in low temperatures and a lot of snow. The area has a subalpine climate with mild and dry summers and very cold, wet winters. Over 500 inches of snow can fall at Crater Lake per year, with more than 60 inches of rain. Snow can fall in almost any month of the year but is heaviest from December through to March. The coldest temperatures at Crater Lake are witnessed in January, which sees average lows of 18°F (-8°C), while the warmest temperatures occur in July, which has average highs of 55°F (13°C). 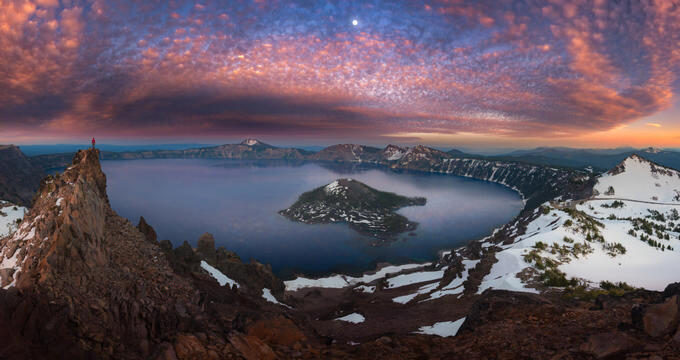 Oregon is the ninth highest state in America with a mean elevation of 3,300 feet (1010 m), so the elevation of Crater Lake is much higher than the state average. Oregon’s highest point is Mount Hood, part of the Cascade Volcanic Arc, which has an elevation of 11,249 feet (3,429 m), while the lowest point in the state is technically the Pacific Ocean, which is at sea level. The state’s major cities include Portland, which has an elevation of 49 feet (15 m), Bend, which has an elevation of 3,623 feet (1,104.3 m), and Salem, which has an elevation of only 154 feet (47 m). The highest city in all of Oregon is Lakeview, which has an elevation of 4,802 feet (1,464 m).